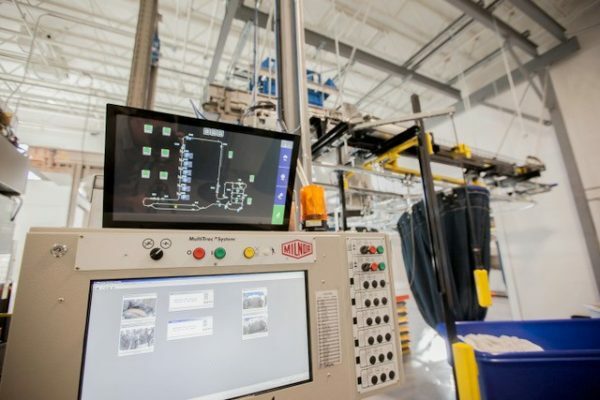 A partnership between Milnor and Ecotex Healthcare Linen Service has resulted in a state-of-the-art new healthcare laundry in Kelowna, British Columbia, that is loaded with energy, chemicals and water - saving efficiencies that offer environmentally friendly sustainability along with built-in reliability. Ecotex Healthcare Linen Service, founded in 1974, has been operating plants and providing healthcare linen services in Canada and the United States of America for nearly 45 years. 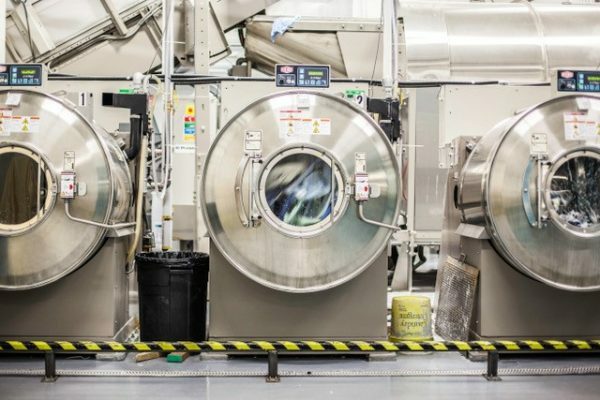 Having grown into the largest privately-owned healthcare laundry operator in Canada, they now process tens of millions of kilograms of laundry each month for their healthcare clients. Bryan Bartsch, vice president of group operations, and Randy Bartsch, CEO, worked with authorized Milnor dealer Nicholson Mechanical Ltd to build a new plant in Kelowna, British Columbia. The laundry was designed to service 80 healthcare facilities scattered geographically in the interior region of British Columbia, including Kelowna, Kamloops, Vernon, Penticton, Trail, Nelson, Castlegar, Cranbrook, and Salmon Arm. "We selected Milnor as a partner for the Kelowna project," explains Bryan, "because of the capability of our local Milnor distributor, Nicholson Mechanical, and to ensure we maintain parts redundancy for the region. We operate a fleet of Milnor tunnels in the Northwest, so when we built a new plant, it made sense to keep interchangeable parts and expertise in the region." Upon its completion in May 2017, the plant featured two 150 lb(68 kg) 10-module PulseFlow® technology tunnels, 10 Milnor 64064 gas dryers arranged in a pod configuration, three 170 lb (77 kg) Milnor dryers, and three 170 (77 kg) Milnor washer-extractors, as well as an automated rail system and flatwork finishing equipment. With PulseFlow technology, Ecotex-Kelowna has been able to achieve water usage of less than one gallon per pound of linen (8 liters per kilogram) plant-wide. PulseFlow technology works by beginning with the patented first module feature, RecircONE® wet down to inundate the linen with recirculating water and first module chemistry at a rate of almost 400 liters per minute. This process allows the washing to start immediately, which saves time and the need for dedicated wet down modules that are utilized in bottom transfer tunnels. 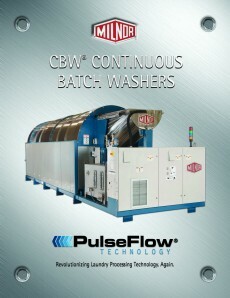 PulseFlow technology then continues with a three-step wash/dilution process in each module. The first step is the wash process employing standing bath washing similarly to a washer-extractor's wash step. This allows the chemical energy to release and suspend the soil from the linens. The next step begins the first part of the dilution process. High velocity counterflow rinsing takes place, which dilutes the loosened suspended soil, similarly to a washer-extractor drain step. The last step of the dilution process involves Milnor's True Top Transfer, where perforated scoops move linen by lifting the goods out of the water, draining the free water, and the sliding the goods into the next compartment. The quick transfer process happens in just a few seconds, and the goods are then submerged in progressively cleaner water. Because the goods change baths upon each transfer, they achieve approximately the equivalent of a second dump and fill and nearly twice the dilution of bottom transfer tunnels. This process happens in each module (except the last module which is for finishing), resulting in clean linen exceeding industry cleanliness standards. After each batch has completed the wash process and has been extracted in single stage presses, the goods are transferred to the dryers via a press-to-dryer rail system. 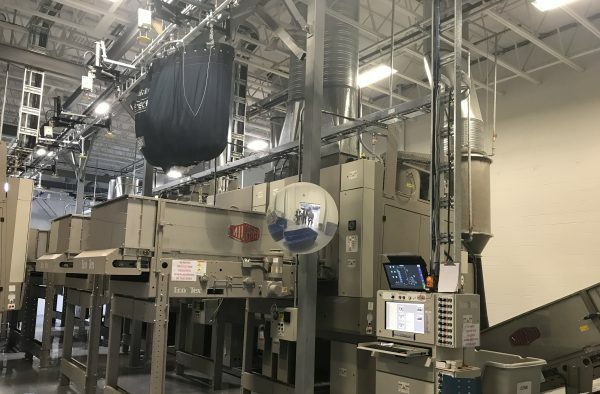 The dryers at Ecotex-Kelowna are arranged in a 'pod,' which promotes efficiency by eliminating travel and elevation time of a shuttle to load the dryers. Dryers are paired across from each other with a conveyor in-between to form the pod configuration. This allows a double-batch of linen to be staged on the stationary conveyors between a pair of dryers. As soon as one of the two dryers has discharged its current load, the conveyor quickly loads the empty dryer with the next batch, minimizing the time between dryer loads. Additionally, a dryer pod system allows the dryer bank to be placed anywhere in the laundry, separate from the wash aisle. It also provides a storage buffer between the press and dryers so that the wash aisle and dryer pod can operate more efficiently. The dryers discharge their loads onto dryer discharge conveyors and proceed to load carts. The cart, loaded with linen, is wheeled over to the flatwork area for final processing and packaging for transport to the healthcare facilities and clinics served by Ecotex. "We are very happy with the dryer pod system, which loads the dryers with slings," notes Bryan. 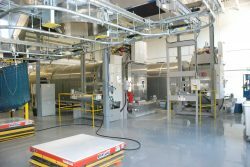 "This was key to materials handling and efficient use of the building." Over the last year, the laundry has operated 10 hours per day, seven days per week and processes 18 million pounds (8,164,663 kg) per year. The 100 full-time employees provide off-site laundry services, onsite laundry distribution at acute care hospitals, and operate the regional distribution services. "The Milnor system has been operating for one year now and has achieved nearly 100% uptime," says Bryan. "Nicholson Mechanical delivered the project on time and on budget and provided just the right solution for Ecotex." 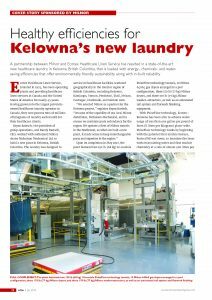 Ecotex designed its Kelowna laundry to meet current and future client volumes while incorporating redundancy into every aspect of the plant. Every piece of equipment has a duplicate machine to ensure they will always be able to run. Ecotex is an established industry leader in environmental sustainability and is a certified Clean Green company by Textile Rental Services Association (TRSA) for its environmental laundry practices. 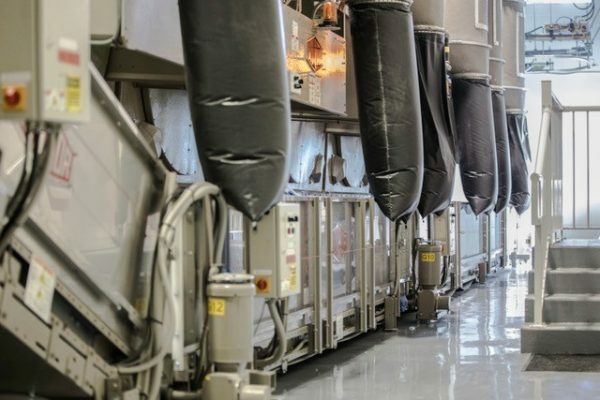 The facility incorporates the industry's best practices for energy conservation and fresh water use and is designed to reduce the environmental footprint from laundry generated by a health system by more than 60%. For more information, please email milnorinfo@milnor.com or call 504-467-9591.